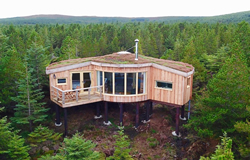 Secluded self-catering tree houses on the island of North Uist in the Outer Hebrides. Spectacular sea views over the forest to the beach, machair and Atlantic ocean. There is a wealth of wildlife including the UK's smallest bird the goldcrest and the UK's largest bird the white-tailed eagle. Deer are also known to graze right in front of your cabin window. The tree houses are an ideal place to unwind, surrounded by nature and a truly beautiful coastline. During the summer solstice when the days are long you can watch the sunset, then follow the sunset colours as they travel a short distance along the horizon before rising again to the east over the Harris hills. All from the comfort of your reclining sofa. When the days are shorter we have some of the most amazing stars and even the opportunity to watch the Northern Lights. The walking, wildlife and outdoor activity opportunities are endless. The local seafood is the best you will ever eat. We look forward to welcoming you! Real wood burning stove, large wrap around windows, reclining sofa. Fully equipped kitchen with dishwasher & microwave. King size very comfortable chunky oak bed. Cotton sheets and feather duvet. Leads out to balcony over looking the forest and out to sea. Free standing double ended bath with picture window to soak up the views. A really good shower! All towels and bathrobes provided. The secluded forest tree houses are accessed by an uphill forestry track and are approximately 400 meters off the main road. Please be aware that whilst the track is suitable for most cars it is a working forestry track and may not be suitable for low vehicles.